After a great game of rugby at the Stoop and a good nights sleep in my Premierinn room, it seems people really do take the whole shhhhh be quiet thing seriously which is great, it was time to head off to Coventry. I’d stayed in High Wycombe, which wasn’t really by design, but it meant I’d be replicating the journey many will have been making for a home game that would have been on their doorstep before. I was interested to see what sort of journey that would be, I travel a lot for my sport of all varieties, generally around an hour for Saracens. My Satnav told me 90 minutes and it was pretty accurate. My understanding is that had Wasps not made the move there would be no Wasps, I imagine that fact with the added bonus of an immense day out added in means that the majority of die hard Wasps fans aren’t too unhappy. The new ‘local derby’ scenario meant tickets were hard to come by, I decided to go the hospitality route to see what that experience was like. It was a little disappointing that I had to add paying for parking at £12 when I’d paid £90 + but I do understand sport is a business. Parking was smooth and meant a short walk over to the stadium, 2 lovely Coventry Ambassadors were waiting to direct people to the right part of the stadium which was an improvement on my visit for the Exeter match. I made my way to the Phoenix to find a very impressive set up, a huge room decked out in Wasps colours with maybe 50 tables for 10 set up. I was a little worried I’d be billy no mates for the meal but I was joined by a group of 7 friends on one side and 2 on the other. A positive before a negative – the food was really good, considering the number of people being catered for, it was well cooked and tasty. The drink situation however was a shambles – there was a very snazzy double decker bus – and 2 people serving huge numbers of people. I expect lessons will have been learnt. 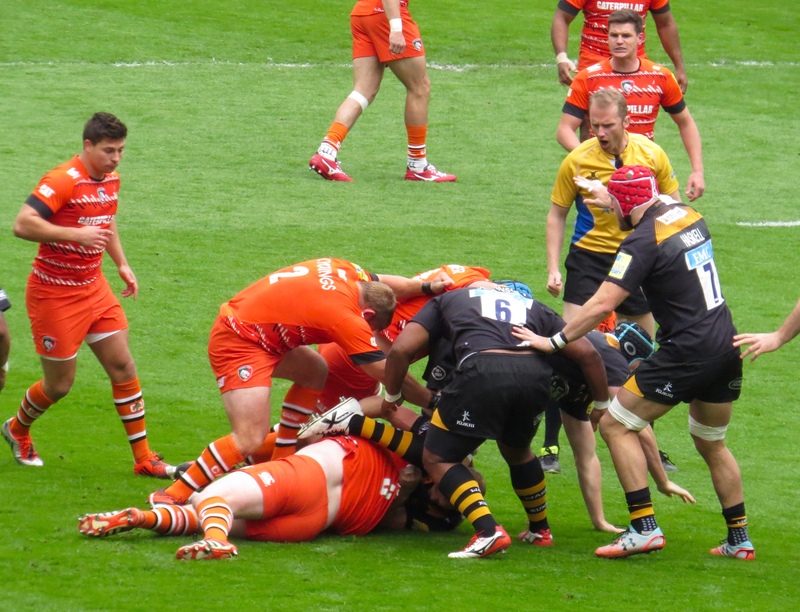 We came to game time – this was another key fixture, with European Rugby available to the Top 6 and a play off semi for the Top 4, both teams had a lot to play for. 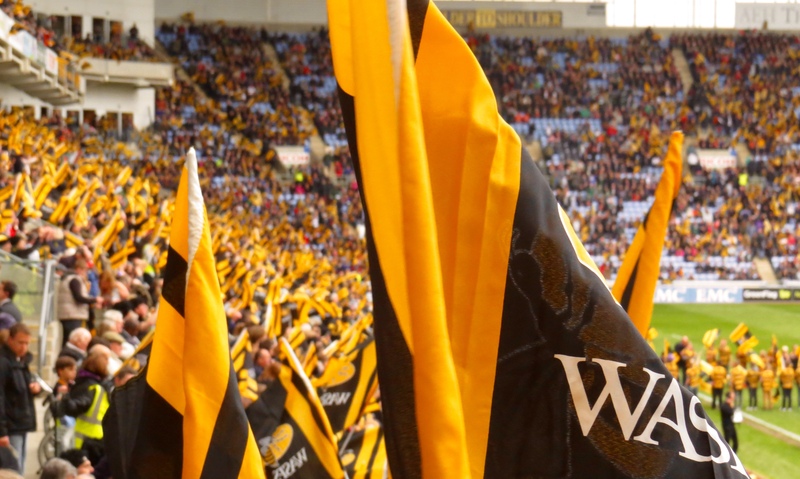 Wasps really are building something special at the Ricoh Arena and a record crowd for a club game outside of London of 32,019 made sure the atmosphere was immense! 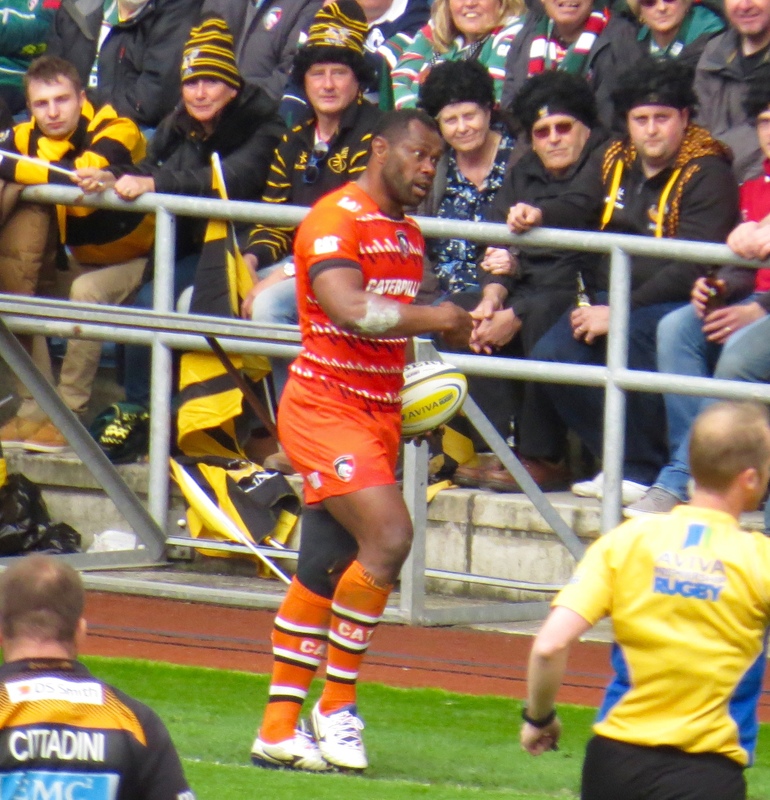 I’d say the Tigers travelled in numbers – they really do have a great and loyal fan base. 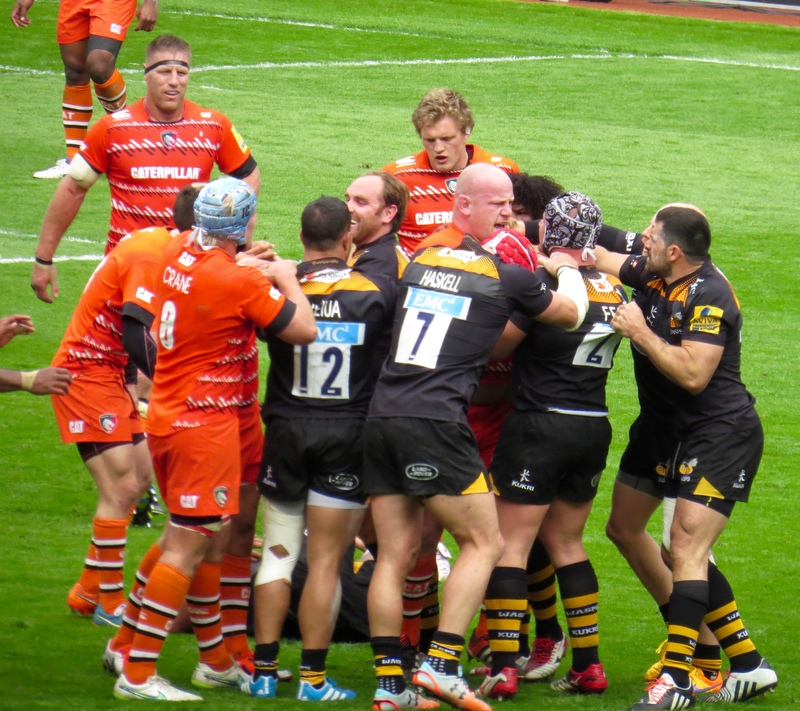 The Tigers emerged to ‘What’s New Pussycat’ which was highly amusing – Wasps ran out to a sea of black and yellow flags. 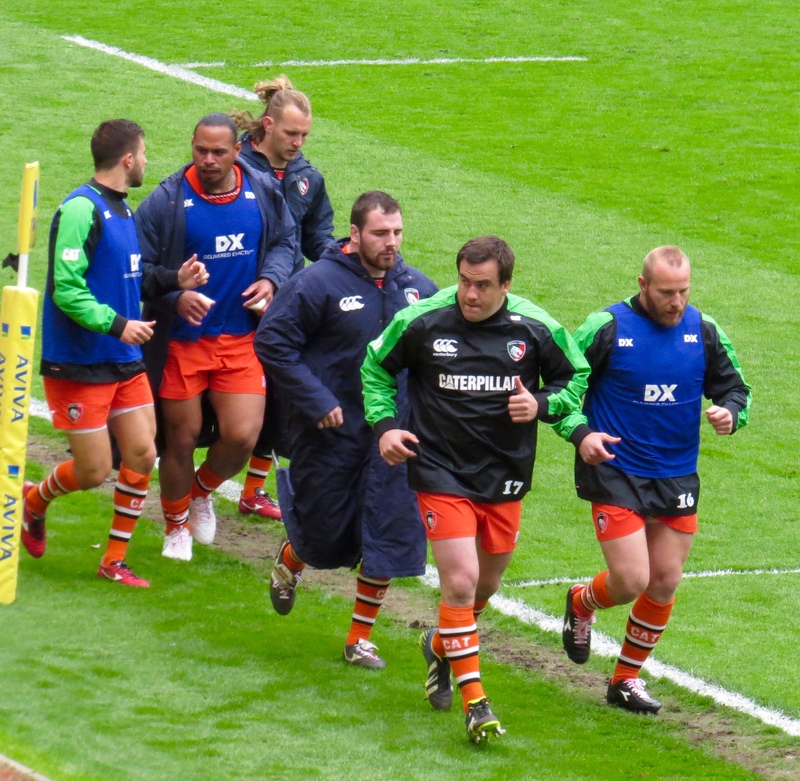 The visitors in their vivid orange kit may have come out to a Pussycat song – but they started as roaring tigers! To say they’ve had a mixed season would be kind, they suffered a shock 45 nil defeat at Bath only to beat them at Welford Road; they sat 4th in the table before the game started. 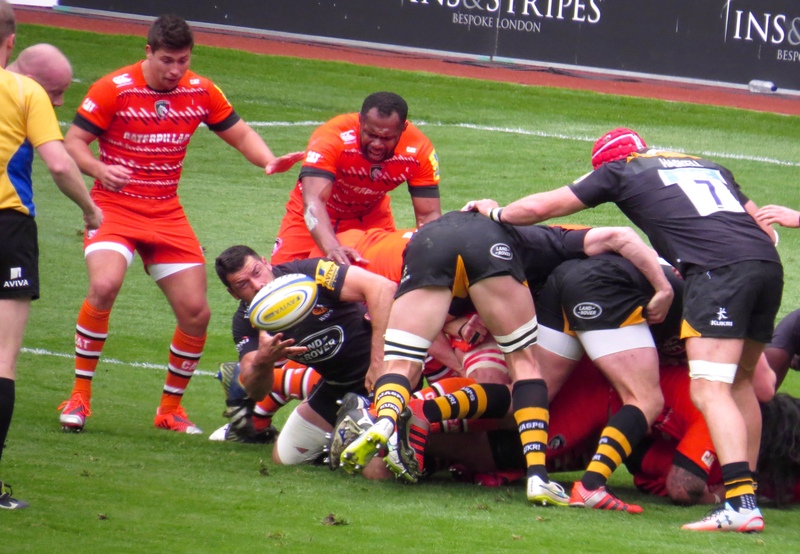 They looked every inch a Top 4 team as the game started – I saw the same sort of determination shown by Tigers when they beat Bath – they wanted the win! A Freddie Burns penalty followed by a try scored by Niall Morris put the visitors 10 ahead before Andy Goode (when will he get his hair cut???) added a penalty, followed by another Burns kick. Tigers seemed to have a greater intensity, they were superior at the breakdown, turning the ball over time and again. 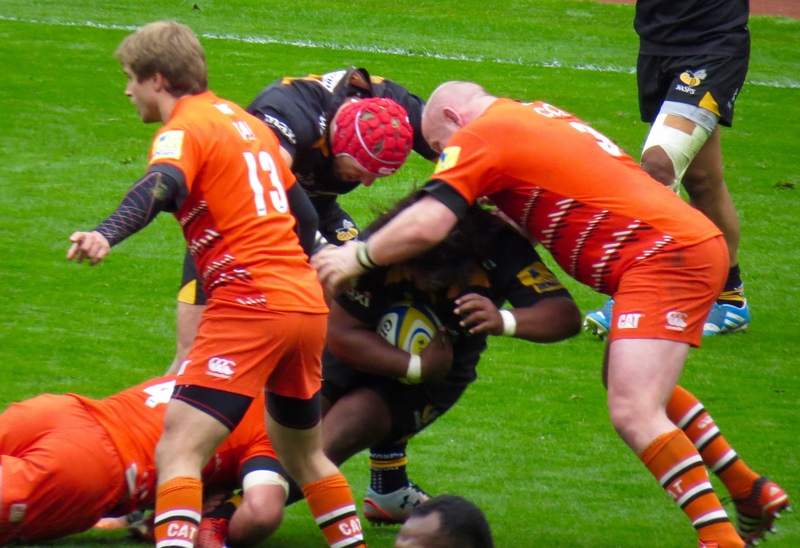 Wasps have always played an exciting brand of rugby, but it was Tigers who added a further try through Vereniki Goneva, Burns failed to convert but the lead was stretched to 12 with the score on Wasps 6 Tigers 18. Goode added a further 3 points minutes before what could have been a defining episode in the game. Seremaia Bai had a moment of utter lunacy, throwing himself into Nathan Hughes in the ruck, there were no arms and he hit Hughes in the side of the head! I’m afraid I yelled out – That has to be RED!!!!! 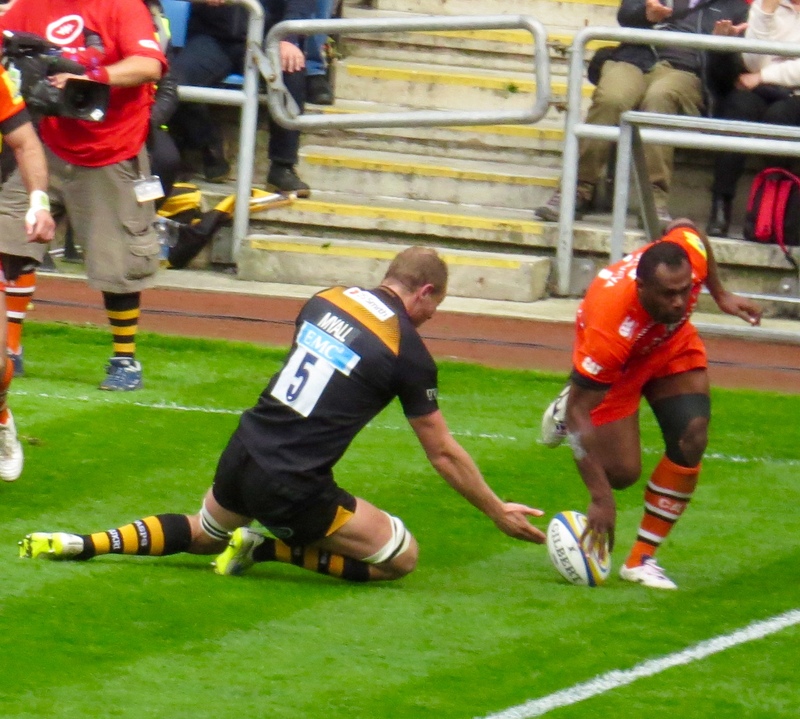 – as Wayne Barnes was getting a yellow card out of his pocket. 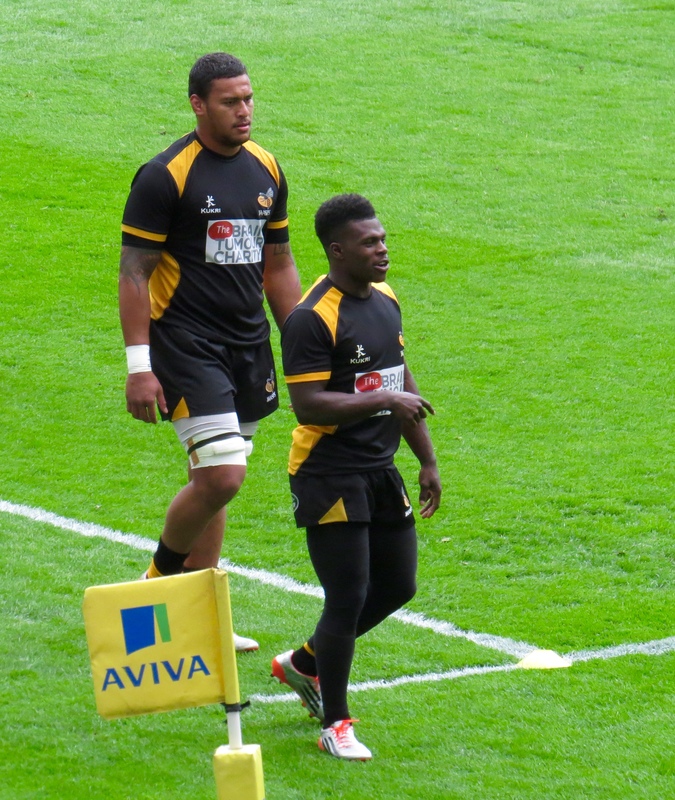 Bai left the pitch only to be recalled once Barnes had consulted the TMO and checked the big screen – this time the correct colour was brandished. 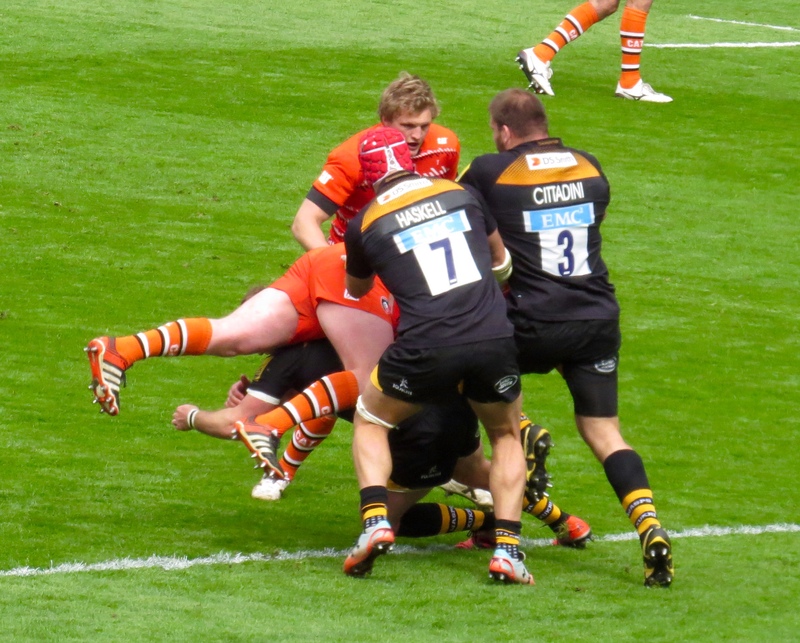 This left Tigers with 14 men for the 44 minutes remaining – a lesser team would have crumbled and lost the game. Playing away against a Wasps team who generally have the capacity to score 5 pointers. 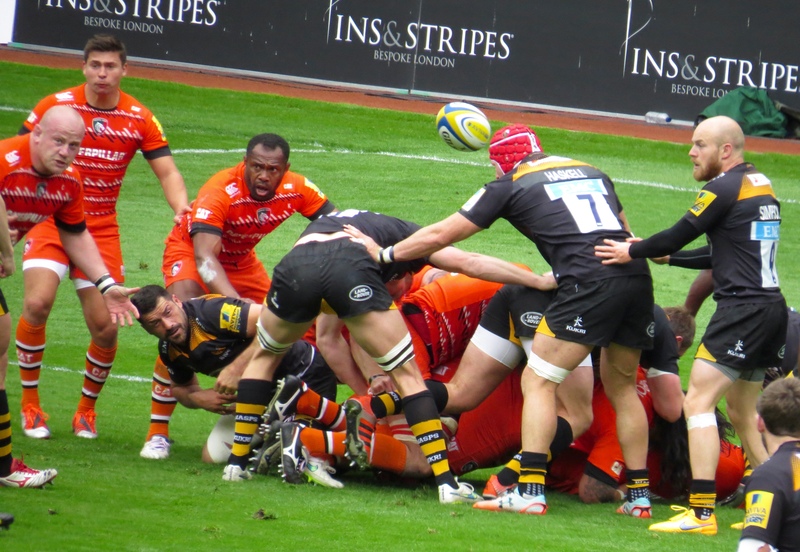 However, all Wasps could add were another 4 penalties, 3 scored by Goode and 1 by Alex Lozowski. 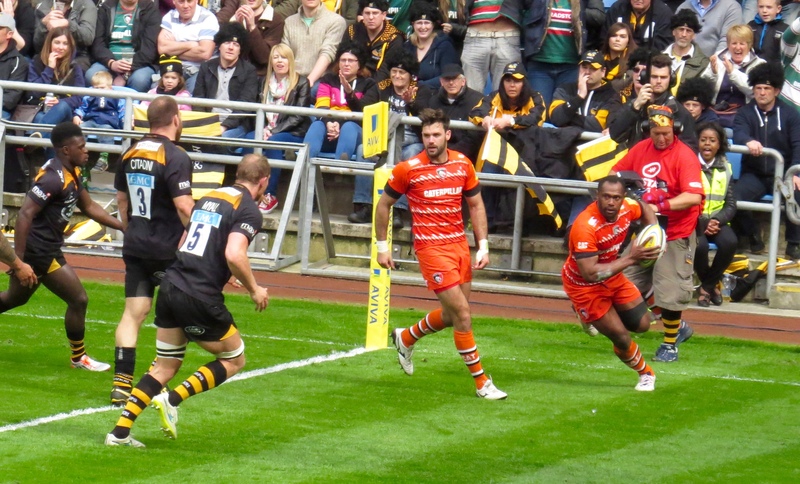 Tigers didn’t look at any time a team playing with 14 men, in fact they scored a further try through Adam Thompstone! 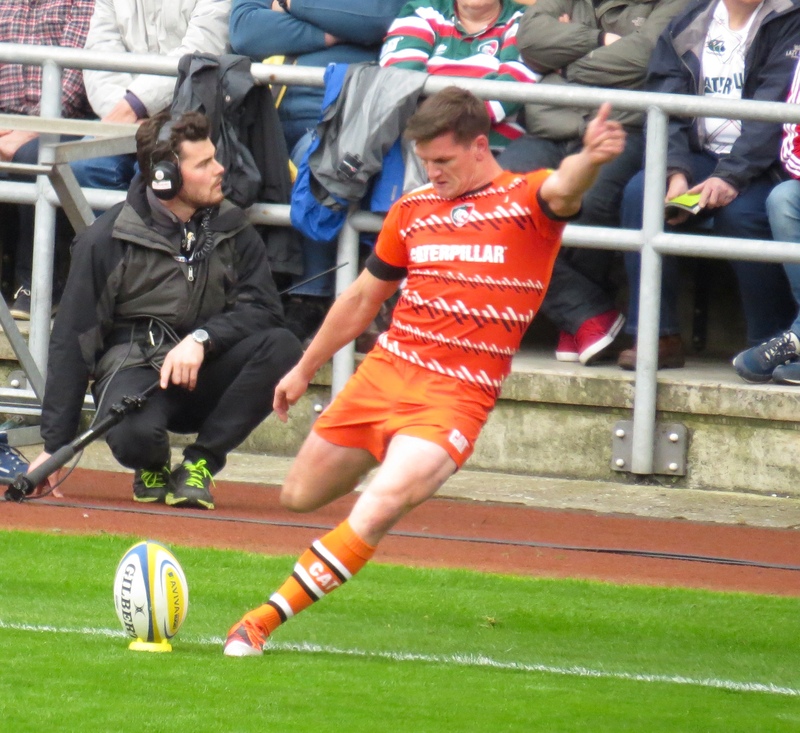 Freddie Burns had added a penalty earlier but failed to convert the try. 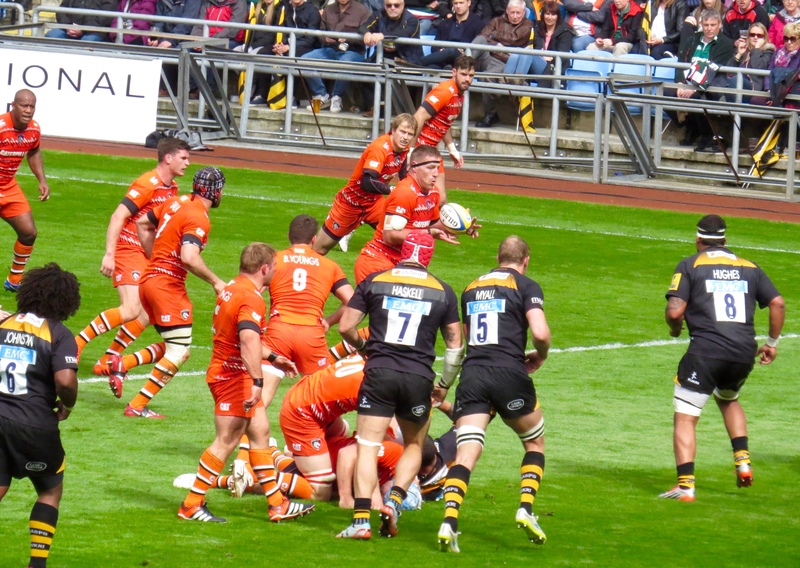 That was all a bit higgeldy piggeldy – but what it all added up to was a win for the Tigers – with the score finishing on Wasps 21 Leicester Tigers 26 – I would judge that in a mixed year this team could well find itself at Twickenham in a few weeks time! 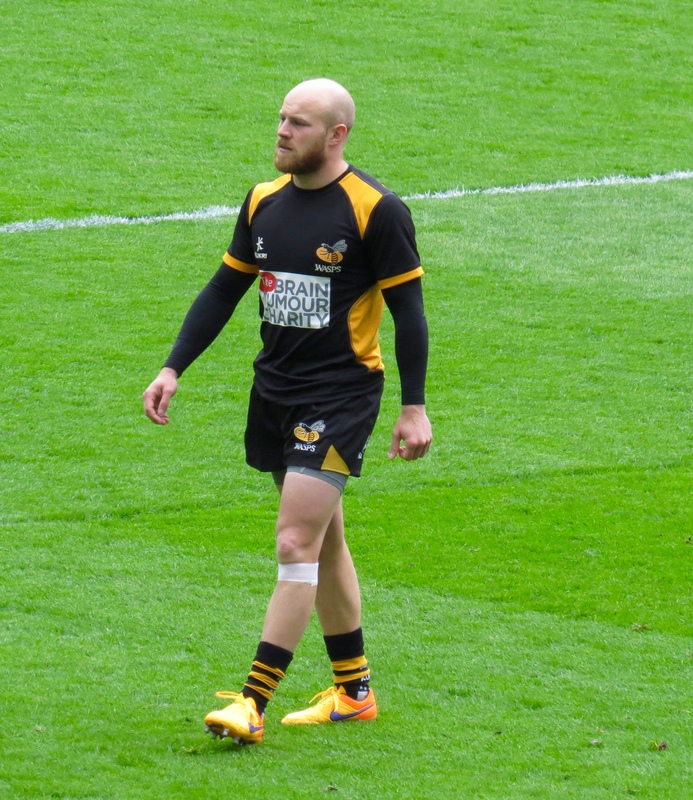 An added paragraph as I’m adding my photos in – I have no idea what Dan Cole was on in the 1st half – but it felt like he was at the centre of any aggro that happened! I think maybe someone had a word at half time! 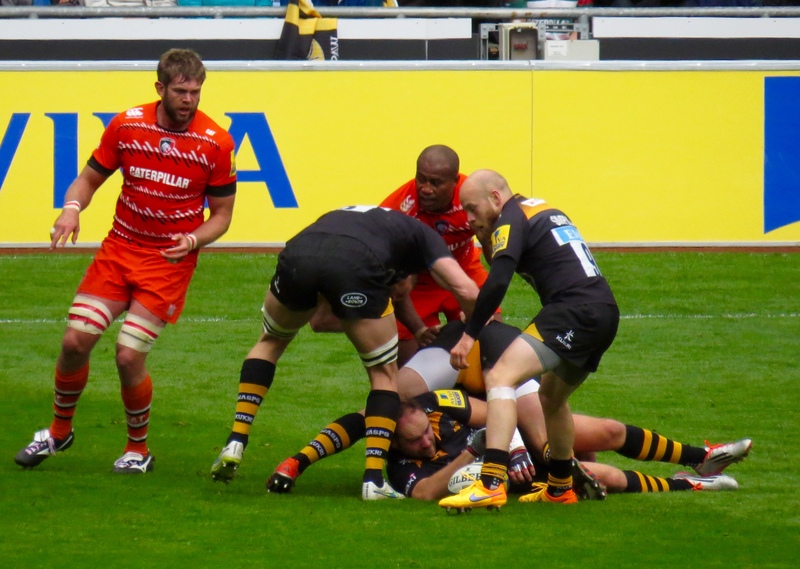 My trip to Allianz Park is yet to be written up – but looking at the table on Sunday evening – Tigers sit in 3rd place and Wasps in 6th – both will want to keep those slots. 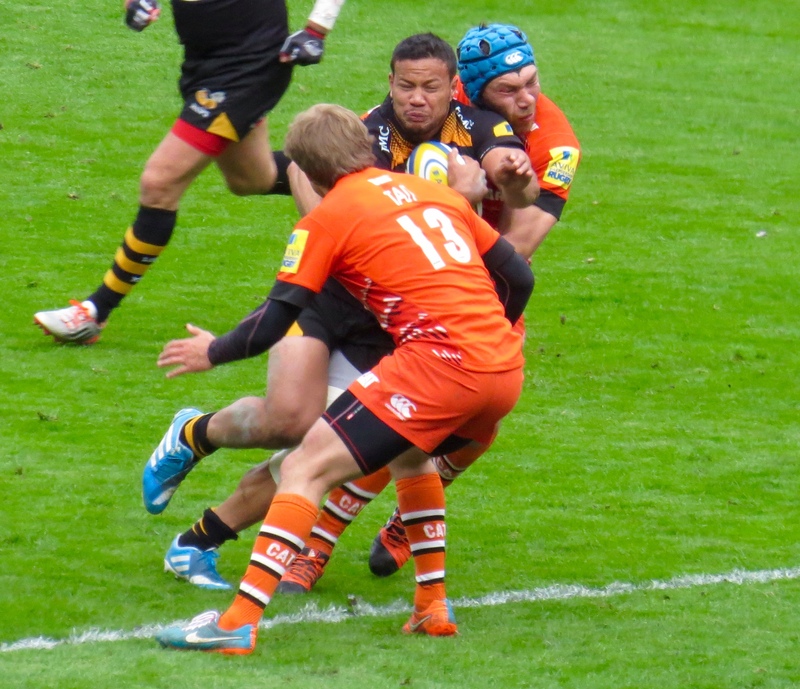 Tigers face Saints at home – Wasps with Sale Sharks breathing down their neck play London Irish away. More all to play for games! It’s been a while since I’ve had a rant about my journey (well in my mind anyway!) but I really do have to rant about some of the worse driving I’ve seen on a motorway! The M40 seems to be a really fast motorway if that makes sense, yet people ted to drive in the right lanes. All but 1 young lady, who thought it was perfectly ok to drive at 40mph in the middle lane! I admit I gesticulated!! But I didn’t swear – honest! Nicest moment – chatting to my table mates – they wee great company. 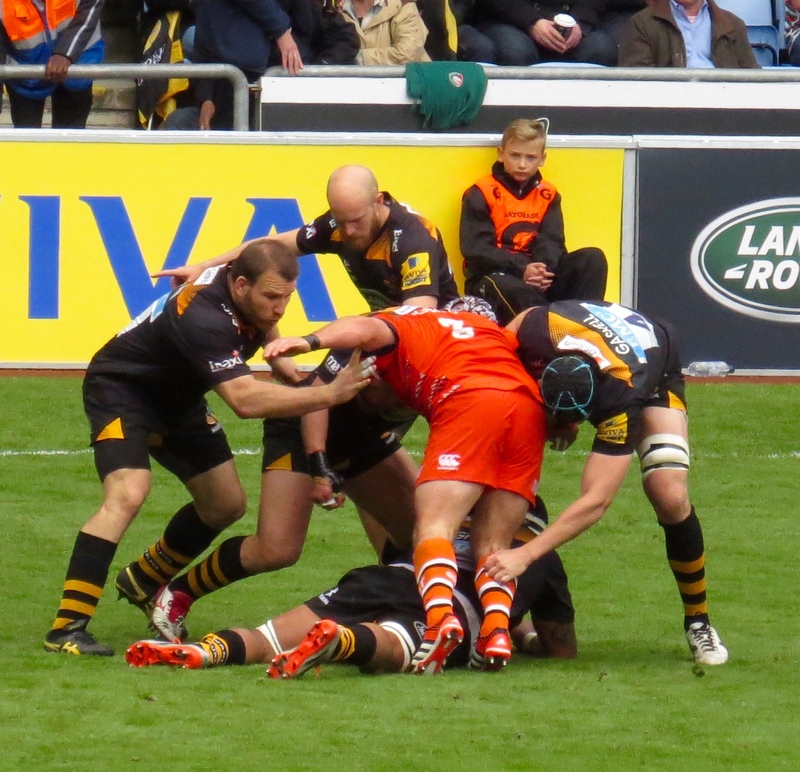 Best moment of the game – a strange one maybe – but seeing Joe Launchbury after a 6 month injury absence. 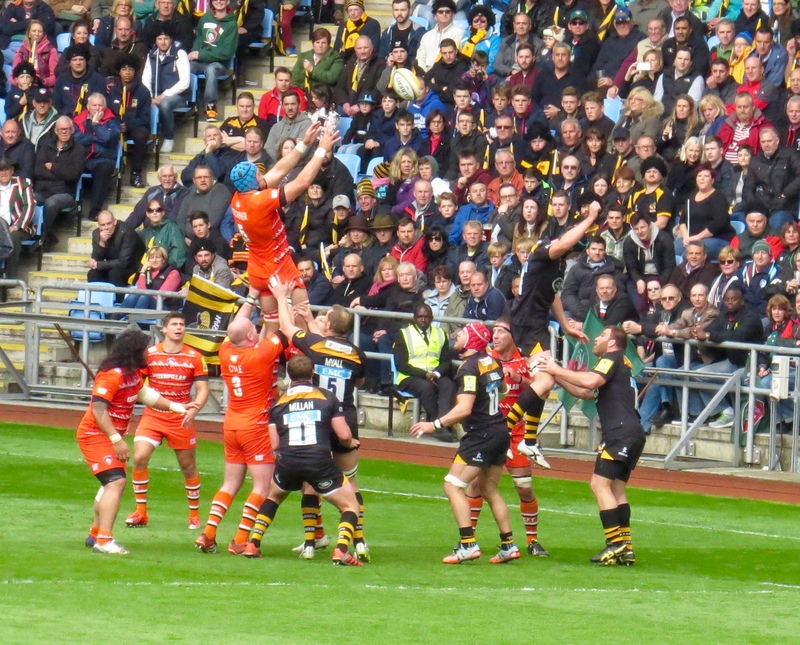 I had a really wonderful afternoon at the Ricoh Arena – I’d recommend a visit next season – a great move for Wasps!